[prMac.com] Perth, Australia - Pixelglow Software today launched Instaviz 2.1 to support Apple's iPhone 6s, 6s Plus and the iOS 9 update. The first and best diagram sketcher now works with iPad multitasking in both Slide Over and Split View modes, allowing users to run another app at the same time. The developer also launched Instaviz Lite, a free app that showcases the core sketching features of Instaviz. "Our customers absolutely love our rebuilt Instaviz 2, giving us 75% 5-star reviews since our relaunch in June," says developer Glen Low, winner of two Apple Design Awards. 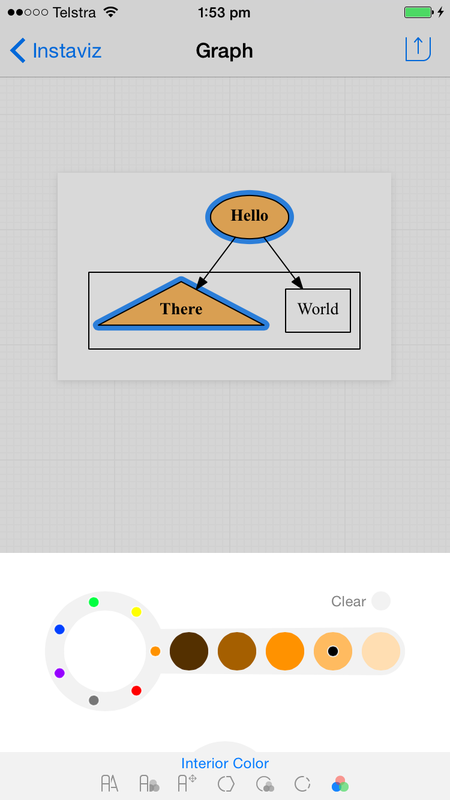 "With the new free Instaviz Lite, even more users will see how easy it really is, turning doodles into diagrams." Users start by sketching some rough shapes, typing in some text then linking them together. Instaviz and Instaviz Lite neaten and arrange them elegantly as the users work, turning shapes and links into beautiful diagrams. With the full app, the users can also refine their ideas with different fonts, colors, styles and shapes next. Then, they can share their work in different formats through email, message, print, AirDrop, Facebook, Flickr, Google , Pinterest, Twitter or WhatsApp. "This is the best simple visual thinking, simple diagramming or back-of-the-napkin thinking app available for the iPhone and iPad," enthuses Dr. George Huba, prominent mind-mapping and healthcare advocate. "And, unlike the napkin you draw on at lunch, diagrams from the program can look good enough to use in books and professional journals without further enhancements. And unlike those napkins, the diagrams from Instaviz come without ink smears, coffee cup rings, and grease stains from errant French fries, freedom fries, chips, British fish and chips, sweet potato fries, tempura, or pizza!" Instaviz is built on two key technologies: Recog and Graphviz. Recog is a new shape recognition library. Trained on over 2,500 sketches drawn by real users, Recog uses advanced fuzzy logic and sophisticated geometric algorithms to recognize sketches in a split second. Graphviz is an automated graph layout engine. The industry standard for automated graph layout, Graphviz represents over 20 years of AT&T information visualization research. Instaviz supports English, Chinese (Simplified), Chinese (Traditional), Dutch, French, German, Italian, Japanese, Portuguese, Spanish and Swedish languages. Instaviz 2.1 is $7.99 USD (or equivalent in other currencies), available worldwide exclusively through the App Store Productivity category. Existing users can upgrade for free. Instaviz Lite 2.1 is free, available worldwide exclusively through the App Store Productivity category. Pixelglow Software synthesizes disparate ideas into simply powerful yet intuitive working software. On the Mac OS X, iOS, Windows and web platforms for over 15 years, Pixelglow Software works with clients ranging from small firms to multinationals like WorleyParsons and AT&T. Their port of Graphviz to Mac OS X took two prizes in the Apple Design Awards 2004: Winner for Best Open Source Product and Runner-Up for Best New Product. In 2005, Apple invited Pixelglow Software to tour Australia and New Zealand to demo new features of Mac OS X during their WWDC roadshow. Copyright (C) 2015 Pixelglow Software. All Rights Reserved. Apple, the Apple logo, Mac OS X, iPhone, iPod, iPad and Macintosh are registered trademarks of Apple Inc. in the U.S. and/or other countries.